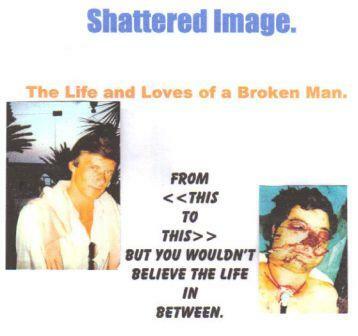 Aldridge website was contacted by Fred Jones about his book called "Shattered Image"
Hello Alan, the reason I am contacting you is briefly set out below, I trust you will give the contents your consideration. 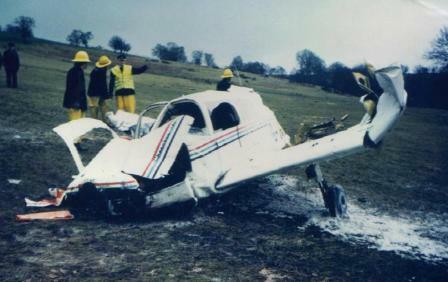 I was involved in an air crash, when the plane in which I was Co-pilot, crashed to earth from 8000 feet, at 182mph. I broke my back in two places, lost my right eye, my nose was sliced off level with my cheeks, I broke my jaw in 4 places which was forced by impact behind my windpipe, I broke my right ankle in four places, and was in a coma for three weeks, all things considered, I was ok ! I was taken to the Royal Shrewsbury until I regained consciousness , then taken to the Oswestry national spinal unit, where I was rebuilt and given the quality of life I enjoy now. Seventeen Cosmetic operations later, I can walk, have a nose made from my right hip and don’t frighten children or elderly ladies with my looks anymore. The proceeds of this book I am donating to the national spinal unit at Oswestry, as they have a funds crisis, so promotion of this book is essential. I have the BBC Radio Shropshire, BBC radio WM, Channel 5, BBC, regional newspapers and two national papers, promoting the book when it is released, NOT BEFORE Many local magazines have also been good enough to agree to promote this book with details which I will forward, nearer the time for launch. Would you be kind enough to help in this good cause. The Oswestry Spinal unit treats people from all over the Country and is not limited to Shropshire. I have been the subject of many TV programme’s including 999, Central, BBC and Sky. It would be marvelous if you would help in giving a vital specialist hospital a boost and help in this promotion. “Shattered Image” The life and loves of a broken man. Fred Jones will be providing more information about his Biography and how you may purchase copies which will help raise much needed funds for the National spinal unit at Oswestry, so please check back here ! Fred explained to me on the telephone that regardless of how much money the book could raise to help the spinal unit at Oswestry, it would never repay the care and medical wonders which now allows him to walk, work and continue to live an extraordinary life today. Supporting the spinal unit, will help to ensure it continues this excellent work in the future ! Wherever you live in the uk, the spinal unit in Oswestry is a place you hope you never need, but will be reassured to know it exists. After hearing about Fred, I have to agree. Critic’s Report - Book review. The Life and loves of a Broken Man. “Shattered Image” is a biographical account, written in the third person, of Freddie Jones, the archetypal Thatcherite businessman of the 80s,who’s fall from grace encompasses every sense of the word. Angela Weston, in her account, has captured the essence of the flashy business existence where success is related to risk taking and con-artistry- the bigger the commitment the bigger the rewards. We are let into the world of finance, law and freemasonry, and are left in no doubt to Freddie’s jaundiced views on all. The style of telling the story is jaunty and upbeat – a reflection, it would seem of our hero’s personality. Readers will immediately recognize the type of man involved, his enduring attitude to business, woman and cars summed up in his thought’s on taking possession of his very first car, a souped up mini, “Turn on the engine, put your foot to the floor, and sod everyone else.” Beneath the flip comments and throw away lines, the author appears to be attempting a slightly world weary, laconic pose for her subject, reminiscent of the private eye, Philip Marlowe, so immortalized by Bogart and Mitchum. Jones, it would seem, has seen and done it all, and is portrayed as looking back at his life in a search for what truly matters. The mood is essentially reflective, as the central character contemplates the loss of looks, though not of all his rich lifestyle, what is most important to cling on to. It has an “if I had my life over, I’d do it all again” feel, but at the same time a sense of redemption is there. What Angela Weston portrays so well is a man obsessed, not least by his own seeming invincibility. In the “the Great Lex Deo” and “The Great God Caritias” chapters, the author lifts the lid on both magistrate and freemasons. Freddie is portrayed as worldly wise, Depressed by the rank snobbery and hypocrisy involved, but nevertheless fully prepared to use the system for his own ends. The eventual loss of Poseidon and the traumatic air crash which was so pivotal in Jones’s life are handled very well, where jealousy and revenge hover lethally below the surface. Freddie’s business downfall had an inevitability about it, which the author catches and uses to show the readers a man ultimately redeemed. We know from the “Introduction” and “Reflections” Chapters that there have been fundamental changes of attitude, But as the book progresses many will be intrigued as to just what it would take to induce such a change. The book is an enjoyable fast- moving and sometimes spectacular account of a smooth operator who lived life to the full. He knew what he wanted and he was determined that he would get it, by one means or another. Like the James Bond character he admired and emulated, charm and force were two equally valid weapons to use in his quest. Yet through Angela Weston’s words we see that while Fleming’s hero always won, in real life the endings aren’t always so neat. On top of all else he had endured, only inner strength would do, this he discovered he possessed. As Angela Weston has shown, what he had left was all he really needed.